In a twist on Jesus's direction in Matthew 10:27 to proclaim his Word from the rooftops, Bishop Cynthia Moore-Koikoi preached from atop the third-base dugout during a 4:30 p.m. worship service before the evening Erie SeaWolves baseball game Sunday, July 2, at UPMC Park. 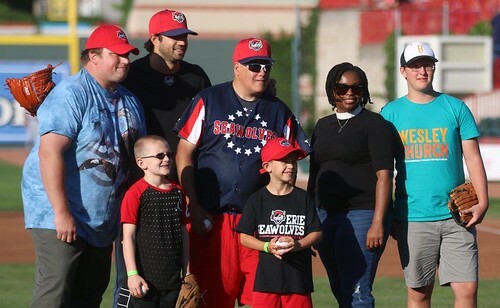 She also threw out the ceremonial first pitch for the SeaWolves game against the Altoona Curve. While the worship service was free and open to the public, tickets were required for the baseball game and several churches sold them and brought groups, said the Rev. Jeff Bobin, who organized the event for the sponsoring Erie-Meadville District of the United Methodist Church and took the photos above. Bobin, pastor of the Littles Corners Charge in the Meadville area, said the Kids' Fun Zone was open at no charge to the community between the worship service and the game. An added bonus -- it was fireworks night after the game.